Darker days may have been so in "X-Men Apocalypse," but today, it's relishing in the glory of claiming the top spot at the box office this weekend. 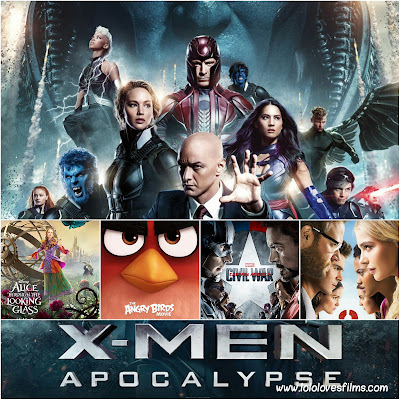 Though weaker than its predecessor, "Apocalypse" opened to the tune of $65,000,000. Its mixed critic reviews may have hurt its opening, but we say don't mind them, if you like the series, it's worth seeing in the theater! The second of this weekend's newcomers claimed the #2 spot, and that's "Alice Through the Looking Glass," which made just a fraction of what its original made. It made $28,100,000. Yikes. "The Angry Birds Movie" came in 3rd place by adding another $18,700,000 to its $66.3 million domestic total gross. "Captain America: Civil War" dipped a little over 50% from last weekend to pull in $15,135,000, bringing its domestic total gross to $372,610,984. "Neighbors 2: Sorority Rising," which made $9,100,000 is falling fast and rounds out the top 5 this weekend. Its 2-week domestic total of $38,336,580. Summer movie season is upon us, and each of the next coming weeks brings another highly anticipated film to throw the box office results into turmoil! Ahhhh, can't you just smell the popcorn popping? ?